The Aurora Tigers’ Peewee A team was looking forward to showing off their creative endeavours next weekend when Rogers Hometown Hockey rolls into Aurora, but eager shoppers were so taken with their artistic efforts, they were a sell-out before Ron MacLean had a chance to pack his bags. 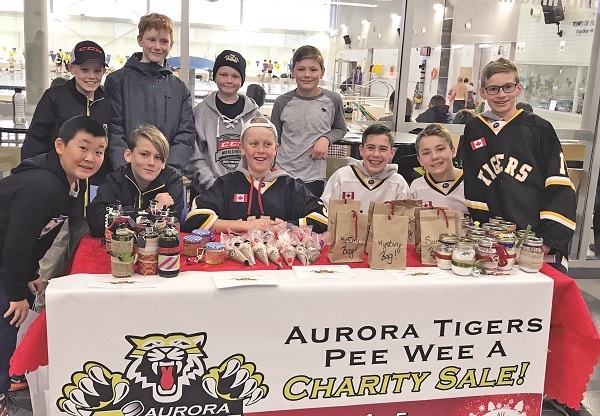 The Peewee Tigers are basking in the success of their first Charity Sale, more than doubling what they expected to make for the non-profit Welcoming Arms through the sale of homemade crafts as varied as hot chocolate, aromatherapy bath salts, and slime. Setting up shop at the Stronach Aurora Recreation Complex this past Sunday from 8 a.m. to 1.30 p.m., they planned on returning to the SARC on the evening of December 7, but their stock of over 90 different items were quickly snapped up by eager customers, allowing the budding hockey stars to double their fundraising goals. “They were absolutely thrilled,” says mom Kasie Savage, noting the team made $760 sales through a $200 investment in crafting supplies. Each year, the Aurora Minor Hockey Association (AMHA) raises money for Welcoming Arms, which provides support and resources for local families in need. They typically do so by asking each player’s parents to contribute between $15 and $20, money which is then collected and donated directly to the charity. This year, however, Ms. Savage pitched a different approach: collecting that same money, but investing it in supplies for the kids to flex their creative muscles and take ownership of the mission. 17 boys descended on her house to brainstorm ideas on what they could make. They looked for things that could be made with everyday affordable items, looking to a few internet hacks along the way. In the process, they talked about what it takes to make a great salesperson and bring all of their strengths together to make the sale a success.